Whether you're a Stitch Fix user or you're considering registering for your first fix, this is the post for you. I have just received my 4th fix and I am absolutely LOVING it! 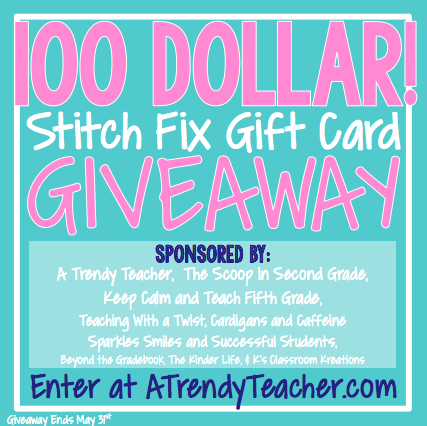 I've teamed up with some awesome teacher friends to bring you a $100 Stitch Fix Gift Card - and the best news is...you have just about a million ways to enter. Follow the links below to secure a spot (or several) in the raffle. 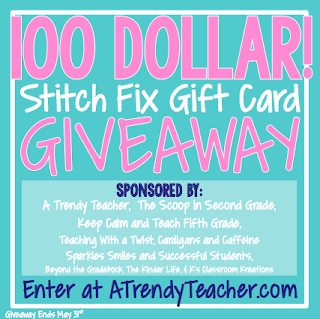 If you're new to Stitch Fix, take a look at some of my older posts. Here I explain how it works and I feature some of my favorite pieces that I got in my 2nd fix. Check this post to see my favorite pieces from my 3rd fix.